Following the annual round of local election results in England and Wales the Centre publishes the Local Elections Handbook, a comprehensive record of election results for each local authority. You can download these results up to and including the 2011 edition. 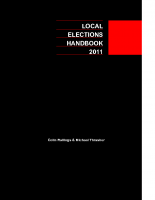 Handbooks in hard copy for the period 2012-2015 can be purchased from the Centre. We still have a limited number of print copies available for past years, so please contact us directly to inquire about these. Please click on the links below to view each year’s local election results.